If you are thinking about a trip to Tuscany or Umbria in 2017, now is the time to start making your plans. Not only does this give you best selection of villas, but it also allows you plan around one or more of the numerous events that are held in the region each year. I have written about some of these before and I will remind you about them here as well as give you a few more. Perhaps the most important although also the most difficult one for which to find accommodation and the most crowded is Easter Week in Rome which begins on Palm Sunday, the Sunday before Easter Day and ends 8 days later on Easter Monday. In 2017, Easter Day falls on April 16. There are several public appearances by the Pope during Easter Week and it possible to attend one of the masses celebrated by him but you will need tickets. These can be obtained on the website of the Prefecture of the Papal Household at http://www.vatican.va/various/prefettura/en/biglietti_en.html. 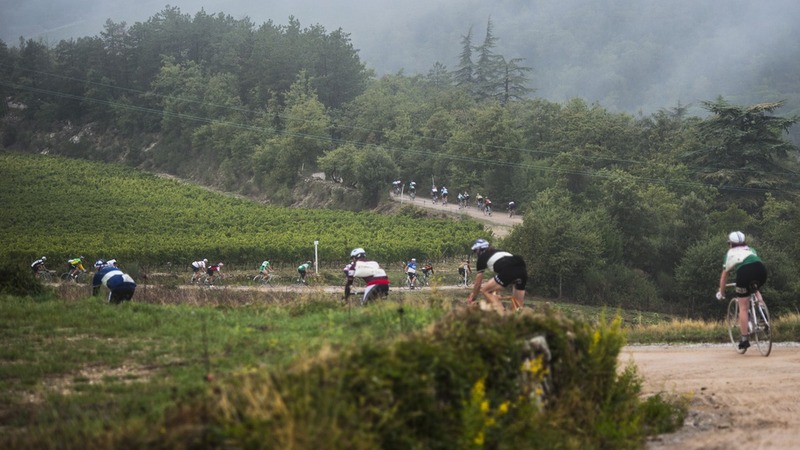 As the pictures below demonstrate, L’Eroica is a cycling event that is a little bit different than the Tour de France. L’Eroica started in 1997 with 92 riders. It now attracts thousands. Although often incorrectly referred to as a race, L’Eroica is a non-competitive event or ride which will takes place every year in Gaiole in Chianti, Siena, Italy on the first Sunday of October. The ride is inspired by historical cycling and the routes include long segments of gravel roads. Riders have the choice of 5 routes, ranging from the shorter Leisure Route, 46 kilometres in length, to the longer more grueling Long Route of 209 kilometres. 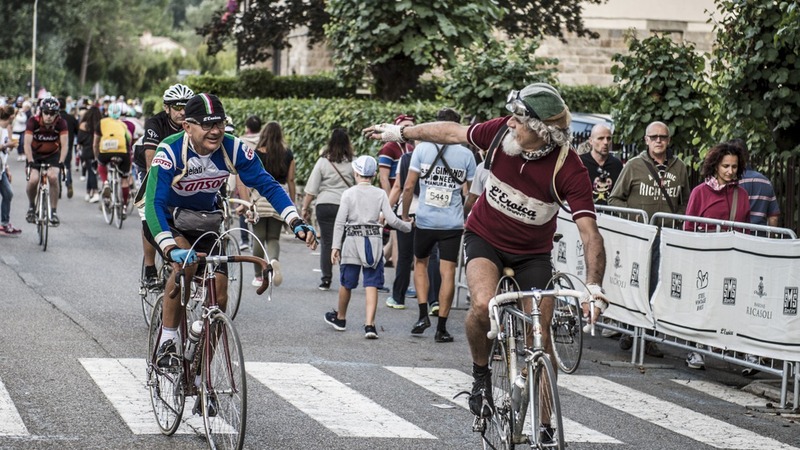 Participation in L’Eroica is dedicated to cyclists dressed in vintage or vintage-inspired cycling gear, riding historical or vintage-style bikes, as described in the regulations governing the event. Only vintage road racing bikes, called BICI EROICHE, made up to and including 1987 or recently constructed but historically inspired bikes if they are road-racing bikes assembled using vintage components or replicated parts similar to the original. 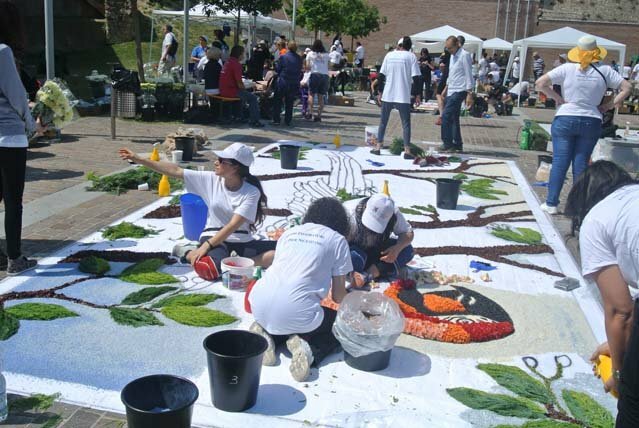 In May and June are the Infioratas or flower festivals put on in various towns throughout Italy. The Infioratas, which literally means “decorated with flowers”, involve the entire community. I mentioned this in more detail in my March 2016 Newsletter. Also described in the March Newsletter is the Festival of Two Worlds in Spoleto in eastern Umbria about 60 km southeast of Perugia. There are numerous historical sites to visit including the largely rebuilt Roman theatre, the stage of which is occupied by the former church of St. Agatha and currently houses the National Archaeological Museum. The Festival, which in 2017 is presently scheduled to run from June 23 to July 9 but this is subject to change, consists of several days of great entertainment including operas, concerts, ballets, recitals, plays, film exhibitions, workshops, conferences, encounters, awards, contests, special events, and a close look at contemporary art. Full details of the Festival, including how to purchase tickets online, can be found on its website at http://www.festivaldispoleto.com/. On July 2, 2017, the first of the two annual Palio races will be held over 3 days. The second is scheduled for August 16, 2017. The race takes place on the last day following various activities that are presented on the preceding days. You can find more details about the Palio in my December 2014 Newsletter and on the official website. The 2017 L’Eroica cycling was held on October 2 finishing up in Gaiole in Chianti. 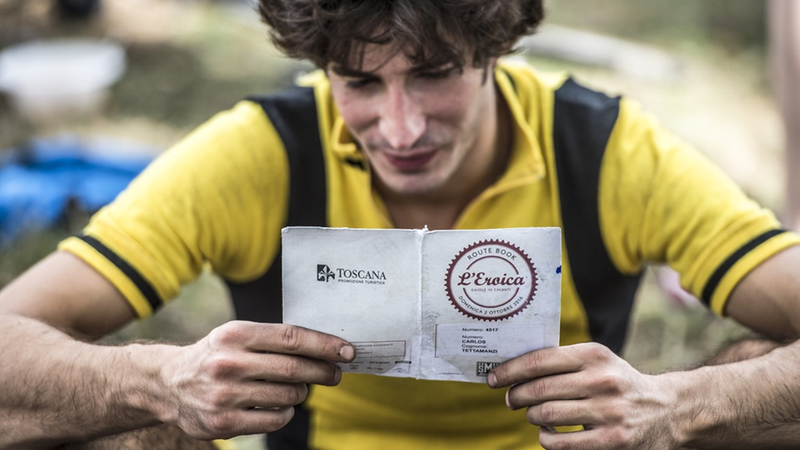 Participation in L’Eroica is dedicated to cyclists dressed in vintage or vintage-inspired cycling gear, riding historical or vintage-style bikes, as described in the regulations governing the event. Only vintage road racing bikes, called BICI EROICHE, made up to and including 1987 or recently constructed but historically inspired bikes if they are road racing bikes assembled using vintage components or replicated parts similar to the original. Here are some great pictures that should give you a better idea as to what it is all about. These photos were taken by Paulo Martelli and downloaded from the official L’Eroica website. Planning a trip to Italy this year? Why not think about taking in one of the countless festivals and celebrations that are put on throughout Italy, many free of charge. See my latest Newsletter for more details of a few of these but here are some highlights. 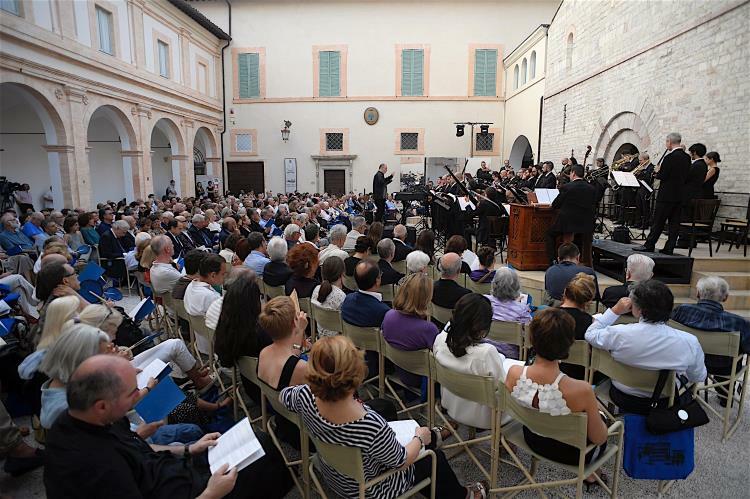 The Festival of Two Worlds in Spoleto takes place from June 26 to July 12 this year. Spoleto is in eastern Umbria on a foothill of the Apennines 63 km southeast of Perugia. This is the 58th edition of the Festival and consists of 17 days of great entertainment including operas, concerts, ballets, recitals, plays, film exhibitions, workshops, conferences, encounters, awards, contests, special events, and a close look at contemporary art. The highlight of the Festival is the final concert tickets for which range from €10 for standing room to €70 for the gold sector. Full details of the Festival including how to purchase tickets online can be found on its website at http://www.festivaldispoleto.com/. If you like opera, the Puccini Festival will be held in Lucca from July 15 to August 13 and provides production of six of the great composer’s famous operas, including Madame Butterfly, Tosca and La Bohème. Again, full details of the Festival can be found on its website at http://www.puccinifestival.it/en/. 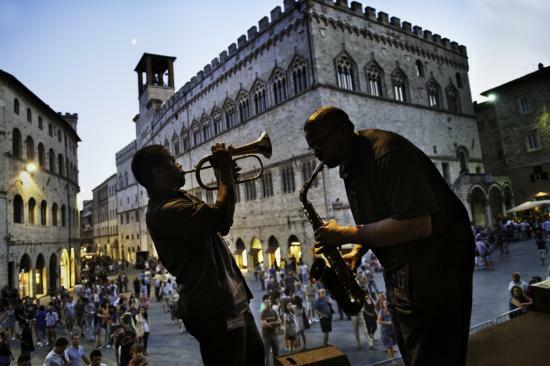 And if you are fan of jazz then you may want to include Umbria Jazz in your itinerary. This year Umbria Jazz runs from July 8 to 17. The heart of the city becomes a veritable musical village where can listen throughout most of the day and evening to glorious music amongst the medieval buildings and squares. This year Umbria Jazz will feature such great performers as Massimo Ranieri, Diana Krall, Ezio Bosso and many others. Full details about Umbria Jazz, including how to buy tickets online, can be found on the festival’s website at http://www.umbriajazz.com/. With a little bit of planning you can easily make plans to include them in your schedule. Take a few moments and google Italy festivals and celebrations and you will be well on your way. Remember, dates can change, even at the last minute so do check up on the local festival and tourist information websites. An often overlooked destination for visitors to Tuscany is the town of Volterra and the surrounding countryside. Located to in the western part of Tuscany in the Province of Pisa, Volterra is about 80 kms southwest of Florence, about an hour and forty minutes by car. As you approach the area, you will notice a marked contrast between it and the other parts of Tuscany. Here the land is given over much more to general agriculture although wine production is an important activity as well. However, the most distinctive feature of Volterra that sets it apart from the rest of Tuscany is the traditional art and craft of alabaster which flourishes here. Alabaster is a luminous stone which is mined in various locations nearby. There are many workshops that produce superb alabaster statutes and artwork. It is a unique craft that is not replicated elsewhere in Tuscany. 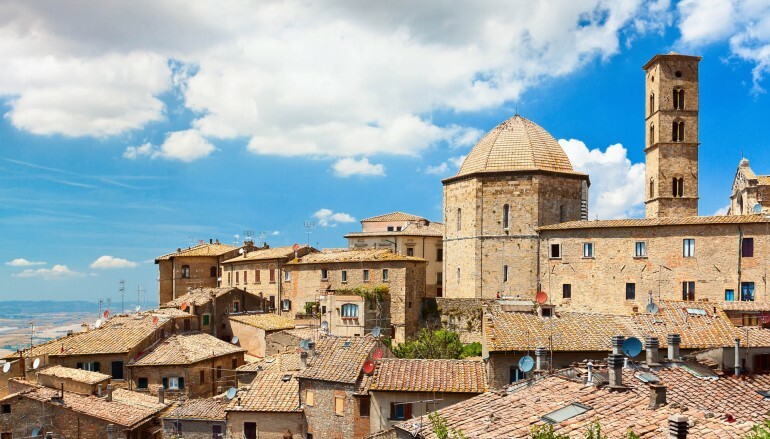 Volterra has a history dating back to Etruscan times. The Etruscan museum in Volterra has a very large collection and has been said to be one of the best Etruscan art museums in Europe. Volterra also played an important part in Roman times however the Roman Theater, which was built in the 10th century BC, is the only monument left in Volterra from this period. The theater is known for its excellent acoustics and provides great views of the town and the surrounding landscapes. While it is possible to arrange for guided tours, a great way to explore the town is to rent an audio guide from the tourist office located in the main square. 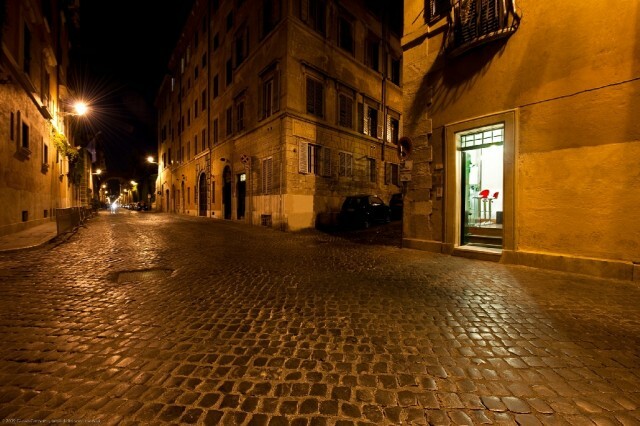 It provides an easy to follow walking tour of the town’s main points and allows you to proceed at your own pace. 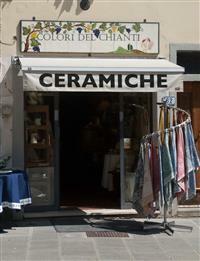 I have recently added a link on my website to Colorei del Chianti, a ceramics shop located on the main square of Gaiole operated by Tania Azzurini. Tania has worked in the field of ceramics for over 20 years. 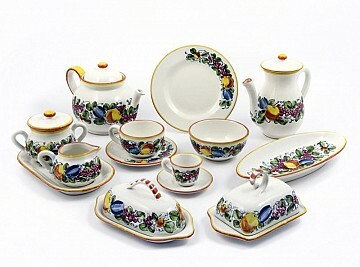 During these years as a ceramicist she has learnt every secret there is to know about the decoration of majolica. In 2009 she set up her own business, opening a workshop in the main square of her hometown, Gaiole in Chianti. The soft lines of her patterns combined with bright colours typical of the area are a trademark of her work which is admired by tourists from all over the world who choose the heart of Chianti as their holiday destination. The hand-crafted nature of Tania’s work allows the client to personalize their orders with inscriptions, dedications or special designs and her creations can be shipped worldwide. You can learn more by visiting her website at http://www.coloridelchianti.com/. 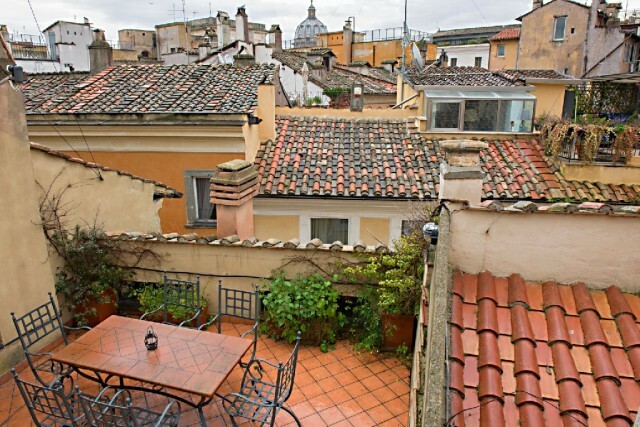 Also new to my website is an apartment hotel in Rome, Maison Giulia, located near Campo de’ Fiori and Trastevere, Maison Giulia offers both hotel rooms and apartments. Breakfeast is available for guests staying in the hotel rooms and apartments have their own kitchens. It is a short walk to the Piazza Navona and its central location make it an excellent starting point for discovering Saint Peter’s, The Spanish Steps, the Pantheon, the Trevi Fountain and all of Rome’s attractions. The rooms have free wi-fi, satellite TV, air conditioning and private bathroom with shower. The hotel has special agreements with garages for those travelling by car. You can find more about the hotel by clicking on the link below. The Chianti wines are known and appreciated all over the world. The Chianti wine region was originally a small area which included only the towns of Radda in Chianti, Castellina in Chianti and Gaiole in Chianti. In now encompasses the areas of the towns of Castelnuovo Berardenga, Poggibonsi San Casciano Val di Pesa, Tavarnelle Val di Pesa, Greve in Chianti, and Barberino Val d’Elsa. These towns all represent the area of wine production called “Chianti Classico” which is recognizable by the Gallo Nero, or Black Rooster logo. The Chianti wine area, however, extends much further beyond the area of Chianti Classico; from Pistoia, in the north, to Montepulciano, in the south, Livorno, in the west, and Arezzo in the east. In order for a wine to retain the name of Chianti, it must be produced with at least 75% Sangiovese grape however to be classified as Chianti Classico the wine must be produced with at least 80% Sangiovese grapes. Chianti wine that has been aged 38 months may be labelled as Riserva. Chianti that meets more stringent requirements (lower yield, higher alcohol content and dry extract) may be labelled as Chianti Superiore although wine from the Classico sub-area is not allowed to be labelled as Superiore. Throughout the region there are many opportunities to taste prestigious labels and great vintages. You can do wine tastings at an enoteca (wine bar) or as part of organized event at a winery or restaurant but my favourite is to visit the wineries that produce the wine. They are throughout the Chianti region and have signs advertising wine and olive oil tastings and sales. If you are going to make a day of this, however, it is best to hire a driver for the day so that everyone in the party can truly enjoy the experience. Attending a festival is simple. You buy a wine glass from the Cassa and Informazioni booth and this allows you to try a certain number of the wines displayed. You can both buy and order wine and olive oil at the booths. In addition to the wine tasting, a variety of events are offered during the festivals. The best place to start when planning your next Vacation or Holiday in Tuscany and other Regions in Italy is to check out my website http://www.susanstuscanyvillas.com. Here you will a find a vast selection of villas and farmhouses. I offer rentals from a cozy one bedroom villa in Florence, Italy, overlooking the Ponte Vecchio, to 10 bedroom luxury villas in Tuscany and everything in between. I have the vacation or holiday rental you are looking for… even if it’s a castle in Tuscany! The Palio is held twice a year in Siena on July 2 and August 16. Siena is divided into areas known as “contrade”. In this famous horse race, which has its origins in the 6th century, the contrade challenge each other in a passionate race which takes place in the heart of the city in the Piazza del Campo. 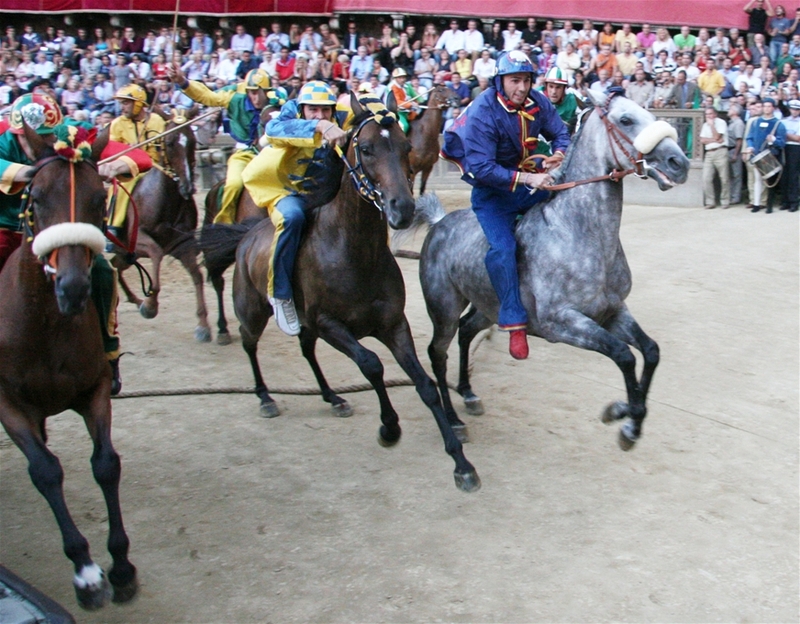 The Palio is held over 4 days with the race taking place on the fourth day. At around 8:00 am on the day of the race the “Messa del fantino” or mass for the horse jockeys is held in the chapel next to the Palazzo Comunale. Then at 10:30 am the “segnatura dei fantini”, in which the names of the jockeys are confirmed, is held. The confirmation of the jockeys is final and no substitutions are allowed after the segnatura dei fantini is concluded. Later in the day each contrada performs a blessing ceremony of its horse and afterwards joins in a large parade which winds through the city and lasts until about 7:00 pm after which the race itself is held. The horses run three laps around the Campo and the first horse that crosses the finish line wins the race regardless of whether or not it still has its jockey. There is no cost to attend the race which can be viewed from the center of the Piazza del Campo. You should arrive at least by 4:30 pm in order to enter into the piazza however the prime viewing locations along the side of the race track are usually taken by morning. Drinks are sold within the piazza but there are no public toilets. Because of the large number of people who are packed in the piazza taking small children into the piazza is not recommended. It is also possible to buy tickets to watch the Palio from various locations around the Piazza. They are expensive but are perhaps the best way to see the event. Several agencies offer tickets for sale and quick search on the Internet for tickets for the Palio will yield a number of options. Many years ago there was a television advertisement for an electric razor for men. The ad featured the president of the company who promoted the product with the simple statement that he liked it so much that he bought it. Recently, one of clients has done just the same. In 2013, after several visits to Tuscany, Peter decided he would join the fleet of villa owners offering properties for rent. He purchased an old house near Castellina in Chianti and undertook extensive renovations. I saw the property before the work commenced and walked away shaking my head at the herculean task he had set for himself. I thought that is would be impossible for him to realize his dreams. The work has now been completed and done. Villa Isola Serena Named after Peter’s his fiancée, is a fantastic property, in a great location and should prove to be a very popular villa. Here is a link to its listing on my website:http://www.susanvillas.com/susans_handpicked_villas_IsolaSerena.html. One of the things that has always frustrated me in looking after my Canadian clients is that bookings had to be in one week segments with only a Saturday to Saturday arrival and departure. While my preference has always for a long stay in one place for two or three weeks, this is not for everyone, particularly for people who are making perhaps their one and only trip to Italy in their lifetime. With the addition of many new properties I am now much more able to accommodate such requests. This season already, I have managed to find suitable dates for two Canadian parties at Agriturismo Collelungo and Castello di Volpaia. In the past, I would have had to simply say “I am sorry, I cannot help you” and turn them away. It was a pleasure that with a little bit of work and flexibility, I was able to find suitable apartments for both parties. Agriturismo Collelungo is in the heart of the Chianti region of Tuscany. It is about a five minute drive to the town of Castellina in Chianti where there many shops and restaurants. Collelungo is an ancient medieval XIVth century farmhouse turned into an agriturismo. With 12 comfortable apartments for rent and a spectacular private villa Collelungo is a perfect spot for long or short stays. All the apartments have lovely views over the vineyards and can accommodate from 2 to 5 people, while the gorgeous villa with private swimming pool can accommodate up to 8 guests. It is the perfect place to discover the beauties of the area starting with the Chianti Classico region with its wineries and vineyards, castles and medieval towns, to the most famous cities of Tuscany; Siena, Florence, San Gimignano and many more. Bread and rolls delivered fresh from the bakery in the morning and a continental breakfast buffet is available at € 10.00 per person. Chianti Classico Wines that are produced at the farm are available for purchase. Castello di Volpaia again is in the heart of the Chianti. There are spectacular views from this village. This is a small village which has a wine bar and an excellent restaurant. Although there are no shops, the Chianti town of Radda is about a 10 minute drive where you will find a wide selection of shops and restaurants. Volpaia is a fortified XII century village which has been painstakingly restored over the last fifty years. Hidden between the historic buildings there are the cellars and equipment for producing Castello di Volpaia’s celebrated wines, extra virgin olive oil, and vinegars. Volpaia is situated on top of a hill and surrounded by the most beautiful Chianti countryside: rolling hills, vineyards, olive groves, cypress trees, forests… Five holiday apartments are available for rent on a nightly basis. There are three separate villas that rent by the week. While the owners have been careful to maintain their original architectural features, the apartments are comfortably furnished and equipped with internet wi-fi, dishwasher (except Balifico), hairdryer, television, cd player, window screens, fridge and oven. Independent central heating makes the apartments comfortable throughout the year. All apartments have an independent garden with barbecue, table and chairs for outdoor dining and relaxing. Castello di Volpaia offers free guided tours of the cellar followed by a tasting of their wines, cooking classes with lunch/dinner to follow, formal lunches or dinners with the owners in their villa or garden, and lunches or dinners in their enoteca. I can match any price on villas listed with other agencies or rented directly by the owner. As a licensed British Columbia Travel Agent, clients have access to the protections offered by the Business Practices and Consumer Protection Act and the Travel Industry Regulation of British Columbia and to the Travel Assurance Fund created under the Act. I am available to speak to my clients and answer their questions seven days a week by phone at my toll free number of 1-877-887-1910. If I don’t have all of the information they need, I know who to call to get it for them quickly and accurately. I accept payment by cheque, bank transfer and credit card and, most importantly, allow them the choice of paying a fixed Canadian dollar price or, if they wish to accept the risk of exchange rate fluctuations and the sometimes unpredictable bank charges for foreign currency transactions, which can add as much as 6 to 8 percent to the cost, the owner’s Euro price.